CARMEL, Calif. – August 8, 2018 – AFAS artist Peter Hearsey will debut two original works at the Automotive Fine Arts Society exhibit during the Pebble Beach Concours d ’Elegance on Sunday, August 26th in Carmel, California. One of his works depicts the legendary Phil Hill, behind the wheel of a Ferrari 250 TR in the 1959 Nurburgring 1000K. 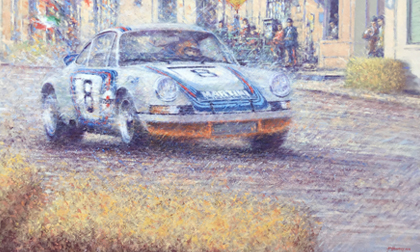 Hearsey’s second painting commemorates the 1973 victory of a Porsche 911 Carrera RSR, shared by Herbert Muller and Gjis van Lennep, at Sicily’s Targa Florio. The Lincoln Motor Company will sponsor the AFAS exhibit on the Pebble Beach show field for the 21st year. While Hill was known for his subtlety – an almost nuanced approach to racing – there is nothing subtle about front-engined Ferrari sports cars at the end of that decade. Ferrari’s 250 TR, with Hill and co-driver Olivier Gendebien, would finish a close second to the Aston Martin of Stirling Moss and Jack Fairman. There is an accessibility to the 911, even in the Carrera RSR form that won the last Targa Florio in 1973. The 917 was for Superman (or Steve McQueen), while the 911 could be seen as a realistic destination for almost anyone with a Bell. Driven by race winners Herbert Muller and Gjis van Lennep, Hearsey’s art captures the Porsche in all of its athleticism. A resident of Douglas on the Isle of Man for some forty years, Hearsey studied at Kingston-upon-Hull College of Art from 1960-1964, receiving a National Diploma in Design. He worked as a designer/illustrator in London, before moving to the Isle of Man in 1977, where he worked as a partner in a successful advertising agency on the island. It was when producing the program for the inaugural Manx Classic that led Peter to specialize in automotive art; he was invited to join the AFAS in 1993. A five-time winner of the Athena award, Hearsey has received commissions from the Indianapolis Hall of Fame Museum, Ford Motor Company and Rolls-Royce. For more information on Peter Hearsey’s art, visit his website.